Chicken, Black Pudding & Honeyed Flaxseed Feta Tray Bake. Sometimes it’s hard to come up with a name for a dish especially when there’s a plethora of ingredients like this one. I’ve thrown a few of the ingredients at the title in the hopes that it will sound interesting enough to have a read of and then maybe to cook. A cinch of a dish. I dreamt this up while thinking about what would be really easy and quick but satisfying at the same time. Curious textures and extra nutrients were added in the form of flaked almonds and flaxseeds. This was quite the accident. Flaxseed is not an ingredient I would normally stock but with sports crazy kids bringing home recipes from nutritionists to try out, we ended up with a bag of them which I mistakenly bought instead of milled flaxseed. Sure what would I know! Very far from a flaxseed, milled or otherwise, that I was reared. So what to do with these curious looking seeds other than to use them up by flinging at them every dish that goes through the pass. Now below may look like an off-puttingly lengthy ingredients list (not everything can be made with just 4!) but many of them are long-life store cupboard ones such as the flaked almonds, flaxseed (ahem, ok these are not normally in my store-cupboard), chilli powder, paprika and chickpeas so if you’re well stocked it’ll just be a matter of picking up a few veg, chicken, black pudding, feta and naan bread. With the chicken, black pudding and feta it’s protein heavy and very satisfying but feels like a healthy balanced meal that doesn’t leave you feeling bloated. What I love is the minimal prep., just the chopping of pepper and red onion and that’s not even done finely so prep only takes about 5 minutes in all. Using mini-chicken fillets cuts the cooking and prep. time with total cooking time 25-30 minutes. Serves: 4 generously, maybe leftovers for someone’s lunch the next day if the munchies don’t see it gobbled it by midnight. Deseed and thinly slice the red pepper. Peel and chop the red onion into wedges. 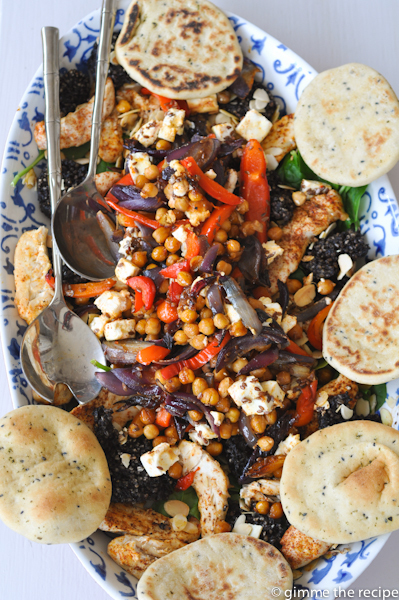 Place the red pepper and red onion into a baking tray with the drained can of chickpeas. Place the mini chicken fillets in a separate baking tray. Drizzle the vegetables and the chicken with oil and then dust with chilli powder and paprika. Bake in the hot oven for 15 minutes. Meanwhile slice the black pudding into rounds and cut the block of feta into small cubes. After the vegetables and chicken have been cooking for 15 minutes remove both trays from the oven. Toss the chicken and sprinkle with some more chilli powder and paprika then arrange the black pudding slices in with the chicken and return the tray to the oven. 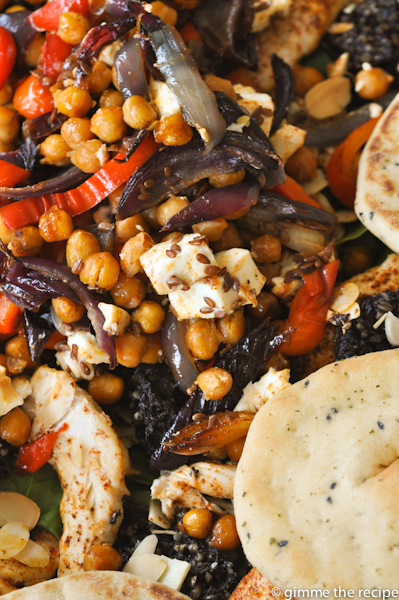 Toss and mix the red pepper, red onion and chickpeas and return that tray to the oven also. Bake both trays again for another 5 minutes. 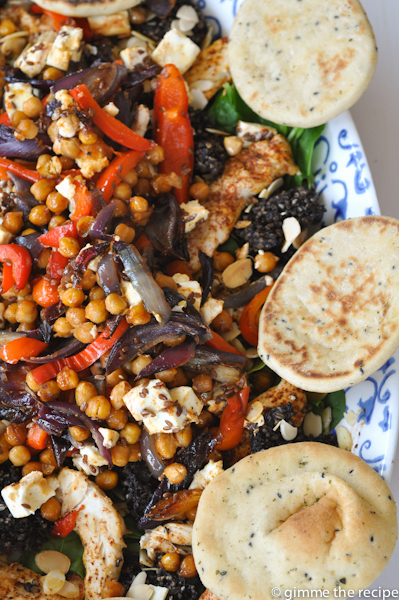 Remove the vegetable tray, scatter the feta cubes on top, drizzle generously with honey and scatter over 1 tbsp of flaxseed, return tray to oven. Remove the chicken and black pudding tray, sprinkle over the flaked almonds and return to the oven again. Finally, arrange the naan bread or flat breads on the third baking tray and heat through in the oven continuing to cook the chicken etc for a further 3 minutes or so until the bread is nicely warmed. Serve on a bed of rocket and spinach leaves and dress with a mixture of oil, red wine vinegar and honey dressing – made to your taste. Leftovers are just as delicious cold. That bake looks so colourful. It must be packed with flavour and it MUST be great for you.